It was just last June that the Amtrak San Joaquin line received a 7th daily train, and now planning for an 8th daily is well underway. The current target, according to the San Joaquin Joint Powers Authority, is January, but I wouldn’t be surprised to see that slip a month or two. The plan is to offer a “morning express,” with service between Fresno and Sacramento. Currently, all trains originate in Bakersfield, with 5 going to Oakland, and 2 to Sacramento. Riders can reach either location the full 7 times thanks to bus transfers. Currently, to reach Sacramento, Fresno customers can board a 6:18am train, and transfer to a bus in Stockton, arriving in Sacramento at 9:45am. OR, they can board a train at 7:53am, with direct service into Sacramento arriving at 11:20am. By offering a train that originates in Fresno, the Authority can better accommodate those aiming to reach Sacramento for a morning meeting. While there wouldn’t be ridership south of Fresno, an optimized schedule could pump up ridership in the northern half of the valley. The plan is to eventually have trains arriving in both Oakland and Sacramento around 8am. The Oakland early train would be the next phase, a 9th daily train. 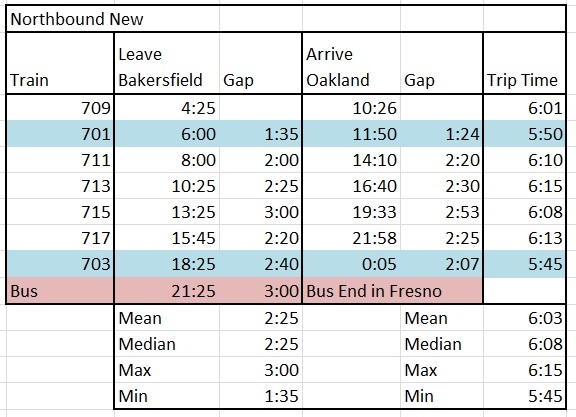 This is the current schedule between Bakersfield and Oakland (blue trains continue to Sacramento, passengers arrive in Oakland via bus connection). 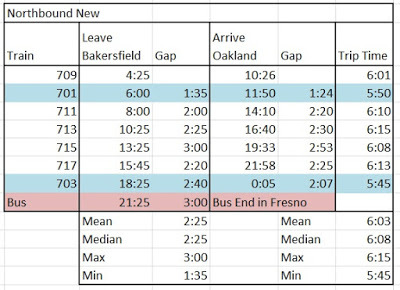 As you can see, an 8am arrival in Sacramento or Oakland simply doesn’t make sense for anyone coming from Bakersfield, as it would require a 2am departure. The full PDF is here. To add a train from Fresno, they need to spend money to create a place where trains can be stored. The location has been identified as Annadale Avenue, between Chestnut and Willow (Google Maps). 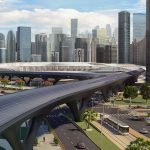 This would store two trains, and cost $1.5m. Additionally, they plan on generating ridership (or accommodating ridership), by expanding the parking areas at various stations. For Fresno, this would mean leasing 50 existing spaces from the city, across from the train station. In Merced, a bus loop would be moved, adding 20 spaces. Turlock would see the existing parking lot expanded into a dirt lot, for 50 new spaces. Modesto would get 77 new spaces in a lot expansion, with the possibility of 124 new spaces to the south. 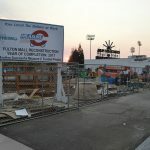 Stockton would get 42 new spaces, followed by 229 new spaces. It makes sense that Modesto and Stockton would get the most parking additions. 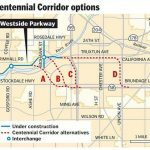 They are closest to Sacramento, so they could see the most commuter use. 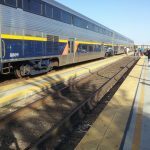 This model has been successful for the Capitol Corridor line, which runs from Sacramento to San Jose, offering 15 daily trains from Sacramento to Oakland, and 7 from Sacramento to San Jose. 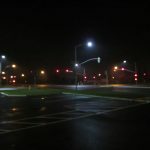 Additionally, the stations are budgeted for minor enhancements, like new landscaping, way-findings, and lighting. Combined, this would be a little under $2.5m in new expenditures. 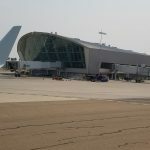 One thing that hasn’t been discussed is where the return trip will be slotted. Current trains leave Sacramento at 6:15am and 5:10pm. I could see the 5:10pm train moved slightly earlier (4:45pm?) with a new departure at 6:15pm to best serve commuters. The alternative would be a late train, around 9pm, to best serve tourists making the most of their day. A later train would also benefit those in the bay area. Right now, the last train out of Oakland is at 5:55pm. A 9pm Sacramento departure would allow an Oakland bus departure at 6:30pm, so they can meet in Stockton. Of course, a complete overhaul of the schedule would be an option as well. I last looked at ridership a year ago. I’ll do a post soon seeing if the 7th daily train has resulted in more riders. I’ll also take a look at improvements made in Stockton. 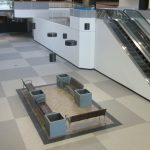 PREVIOUS POST Previous post: Is the “retail apocalypse” only a suburban problem? NEXT POST Next post: Fresno will finally expand bus service past midnight on weekdays! I keep emailing Amtrak and telling them that we need an earlier departure time from Fresno like 5am going to the Bay and having a Amtrak train leaving the Bay at a later time like 8pm to allow day trippers to maximize there trip. For instance I take the train from Fresno to Richmond and get on the Bart to SF. But when I take the earliest train out of Fresno (615am)..with the BART it puts me in SF at around 11am. PLUS the last Amtrak to leave Richmond back to Fresno is 609 pm which only give you about 5 hrs of time spent in SF…which i not enough for day trippers. And I'm sure there are some legalities to this next suggestion BUT they need to somehow increase the top speed of Amtrak trains from 70 mph to 100 mph. Veeeeery true. Caltrain is slow but at least you will get there. I'd rather take the BART in Fremont. But by 2025 they should have extended Bart into SJ. So I would rather take Bart because it's quicker. BART wont be quicker than Caltrain from San Jose. i think it all depends on how many stops it makes. isnt there a express caltrain that only makes a few stops from sj to sf. but usually its the line that has so many stops that makes it longer. So I would imagine Bart would be quicker as I dont see it having nearly as much stops as the caltrain line from sj to sf. Same issue I have with the HSR. 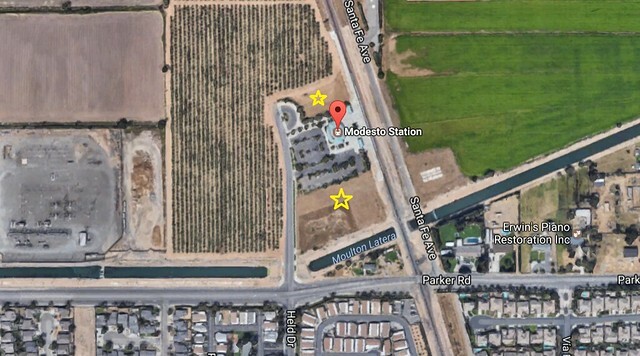 I was shocked to hear that Madera was able to convince the HSR to open a station there. 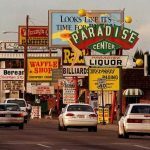 It's what–15mins DRIVE from the downtown main fresno station? Was that really necessary? I bet it was some deal they made since a big portion of the line/land being used is in Madera county lol. I swear next thing you know Los Banos will want a stop. I thought the Gilroy station was pushing it. They already have a caltrain line. You are exactly right. The Caltrain has an express "blue bullet" train with less stops but even THAT route takes an hr. BART according to GOOGLE takes 1hr and 15 minutes. But I wasn't going to argue with the other commenter lol. And yes HSR….gosh man I was an proponent when the deal was 30bil, but now it's 96bil and won't be finished till I'm 60yrs old GOSHDAMMIT! And looks like that hyperloop thing or maglev is a more efficient model. Smh. Freakin Cali. By the time HSR is completed, the system will already be antiquated…it basically already is now. Looks like they listened to you on that earlier service! Also, yuo can always take Amtrak in and then Greyhound Express back down. Top speed on the San Joaquin line is 79mph. They are looking to raise it up to 110mph on the line to Sacramento, since that section will still be popular after HSR opens. Theyre actually using some of the HSR money to do so. Yes James! I'm sure I'm not the only person with the same idea lol. But they still need to get that earlier going (and later coming back) service to the Bay Area. I'm not sure that with this new train that I would go to sac. And I'm more of a purist. I want to get somewhere as simply as possible. That's the whole reason why I started taking Amtrak to sf rather than LA. I consider myself an LA guy, but by having to stop and get off Amtrak and board a bus to go up over the gvine just DOESNT enthuse me at all.